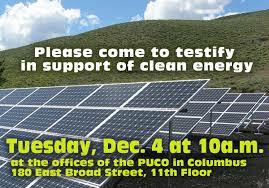 Simply Living Board Member Chuck Lynd was asked by the Sierra Club to testify at a hearing of the PUCO (Public Utilities Commission of Ohio) on behalf of AEP Ohio’s proposal to develop two large solar energy arrays in southern Ohio. More than 50 people attended the hearing to support the proposal according to this article by Ohio Citizen Action. Chuck’s testimony is included below. I grew up in Ironton, Ohio, in Lawrence County in the heart of Appalachia. We were once the center of the nation’s pig iron industry. As a child, I played in the slag heaps across the street from my cousin’s home, a block from the Semet Solvay Coke processing plant, fed by long trains of West Virginia coal. We were in awe of the industry and proud of its accomplishments. It was, of course, very dirty. I remember vividly that our bath water always turned grey from soot as I watched it drain from the tub. When I turned the garden hose on the white clapboards of our house the black soot seeped out endlessly. My aunt and uncle lived across the street from the slag heaps and both died of cancer in their 60s. That was the Old World of mid 20th Century America. Fossil fuel industries were King and Computers were about to digitize our Money and create a Global Economy that has steadily eroded our local economies, including the one that once thrived in Ironton, where my grandfather served as president of the Board of Trade. Across Ohio, we lost half our union wage, manufacturing jobs. Most Ohio cities and towns suffered lower tax revenues. Downtowns were hollowed out and replaced by sprawling chain store operations and low wage, service economy jobs. Small farms were lost as commodity agriculture required increased investments and financing of equipment and chemicals to compete in the global economy. But enough doom and gloom. 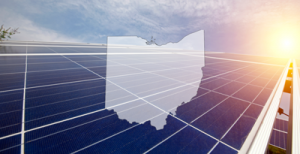 Today the PUCO has the opportunity to contribute to the reversal of this outdated 20th century world and endorse AEP Ohio’s proposal to invest in clean energy that will drive a new 21st century economy. I understand there will be resistance from both investors and workers and even some public officials who are wedded to the old world that we built with energy from coal, oil, nuclear, and fracked-gas operations. But now we know. The pollution and waste from these systems simply cannot continue due to their role in causing the climate crisis that threatens future generations. As numerous studies have documented, the window for transitioning to clean energy and a new more localized economy may be as short as 12 years. The PUCO is to be commended for its Power Forward initiative as it plans to explore all opportunities available to move into this new world of energy and economies that work for all our communities. The PUCO should enthusiastically support AEP’s investments in clean, renewable energy. The proposed developments will actually lower electricity bills while helping to revitalize local economies in our struggling Appalachian communities. Now is the time to position Ohio as a leader in the 21st century.